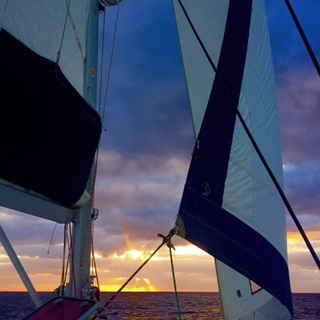 We sailed on, on the Caribbean side, and enjoyed a gorgeous sunset over the starboard side. 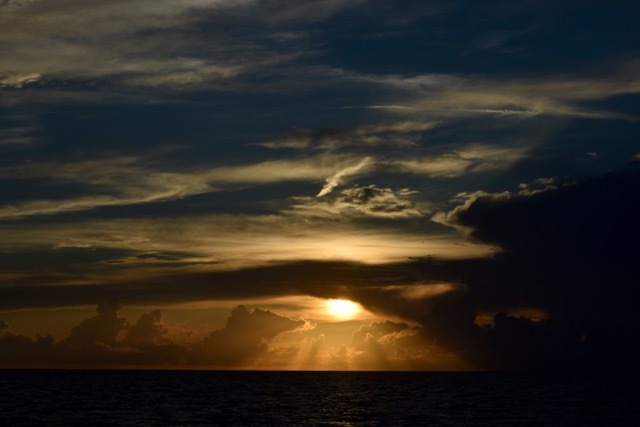 There’s just nothing like a sunset at sea. For dinner I made a couple of loaves of french bread and a big pot of Jambalaya. We decided on our night watch schedule, and set our course through the shipping channel past Andros Island. Once we are past Andros, we’ll pass the Berry Islands and Bimini and on to Fort Lauderdale. There was hardly any wind last night so progress was slow. By midday today we’d made 135 miles since leaving George Town, leaving about 160 to go. My night watch shirt began at 2am, and at that point I was so wide awake, so when Aidan and Jude came on a couple hours later i sent them back to bed and stayed on till 8am. I love night watch. It’s so peaceful and it’s during those times of silence and blackness that one really comes to know oneself. I find myself honestly assessing who I am as a wife, mother, daughter and individual, setting new goals and being prayerful. At 8am i woke Aidan to take my place at the helm and went to sleep till 10am, waking to find the beautiful big spinnaker raised. I never tire or the sight. 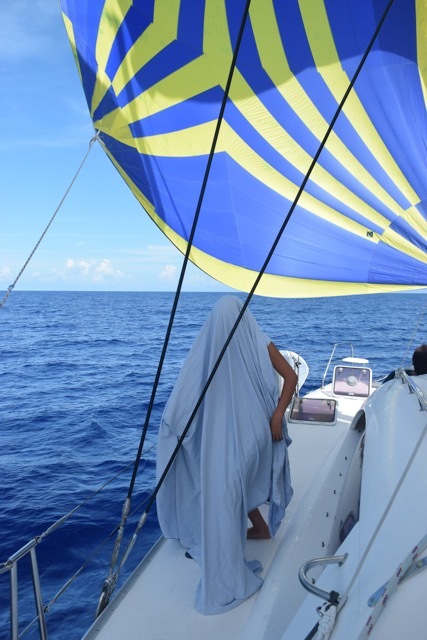 When airs are light and we are on a run, we raise the spinnaker – a giant splash of color and power. It took our speed from 2 knots to 6. The twins were at the helm and could be heard exclaiming in excitement each time they adjusted lines and picked up another half knot of speed. We are so proud of our little sailors. They have already learned so much and are so capable. Through the morning everyone settled into their routines. Emma stayed at the helm and worked on her school work. Jude relaxed reading her Sherlock Holmes book and Mycah attacked her berth with cleaners while Danny and I sat in each others arms out on the bow and breathed in the fresh air while enjoying each others company. When we made our way back to the stern he decided to check one of the fishing lines, thinking we’d snagged some seaweed, and pulled a barracuda. Our fishing friends from Freeport told us that sometimes they use barracuda as bait, so we decided to use this one for it. No sooner had we set the starboard line with the bait, had the rod bent over with another catch. 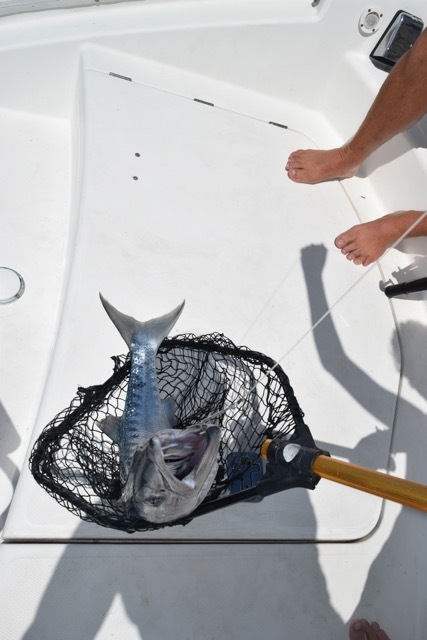 He reeled in yet another barracuda, and this one we let go. Just before I started making dinner, Danny reeled in a huge Mahi Mahi (Dorado). Before he was even done filleting the second side, I had a huge slab of it seasoned and on the grill. Our third day was a really hot day on the water. We were all tempted at different times to jump overboard for a refreshing swim, but stayed firmly on deck. 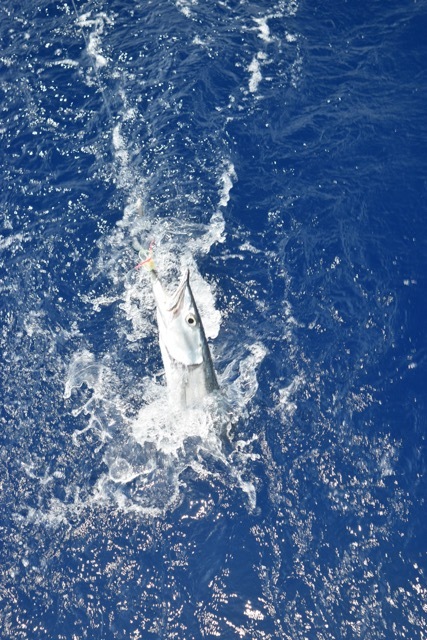 By noon we had already caught 5 barracuda and released them back into the big blue. The craziest part of the day was when I heard the whiz of the fishing line, and went to grab the pole from the rod holder but couldn’t because it was so bent over. I called for Danny and he was able to wrestle it out and reeled in a beautiful young, feisty shark. He was really mad, but Danny was able to get the hook from its jaw and set him free. He was so cute! For dinner I served pasta salad, BBQ chicken and green beans. I also made macaroons for dessert. The crew really seemed to enjoy those. After being at sea for about 300 nautical miles, we spotted Fort Lauderdale’s skyline. Large buildings stretched far across the horizon, which was a rather strange sight to behold after being on so many islands where no other soul was in sight, for 3 months. As we came closer to land and saw more details of the lights, concrete, and fast paced life, we felt even more grateful for the opportunity we’ve had thus far. 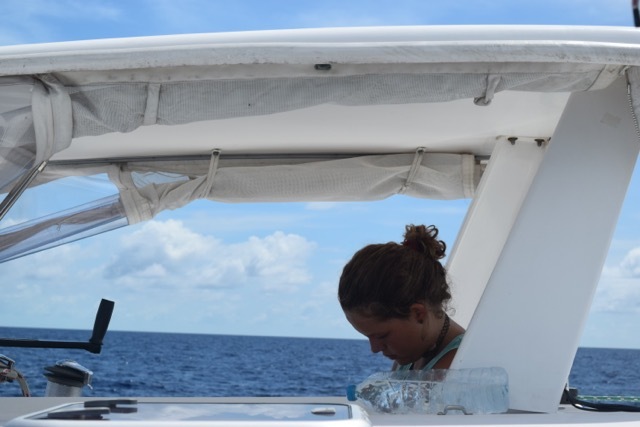 Danny did an amazing job maneuvering the boat through a maze of water ways, past many fancy vessels and backed us into our slip with catamarans on either side of us. His skills never cease to amaze us. Tonight we are tied to a dock, and have the AC going in the hulls, and are all ready for a good solid night of sleep with no interruptions for night watch. We can’t wait to have you on board Captain Elayne! Thank you Mommy. We are cautious with sharks and give them a lot of respect. We love you so much.